I keep myself mindful of goals, desires, and dreams pretty frequently. In fact, each month I review my goals and what I’m doing to reach them. And more importantly, what’s holding me back or distracting me. This is a quick post to outline some major goals for 2015. 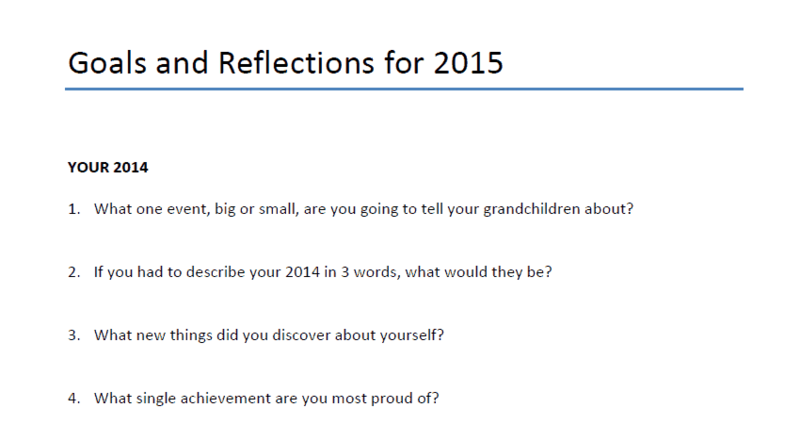 Oh, and I’ll share with you my 10-page document I used to reflect on my 2014 and look forward to my 2015. I measure my upcoming year with successes in clients gained, revenues reached, vacations planned, and projects complete. What’s most important is that I attach this to a vision and visit it each day. And I do that. I have a whiteboard next to my desk and each morning, I recite my “reasons why and goals”. I realized that I spend a lot of time on tasks I can have someone else do. This includes sending follow-up and appointment setting emails, screening certain emails for opportunities, and handling basic business operations and marketing. When I get this prepared with someone capable of learning how to handle different situations, I will be able to focus on work I love and on helping my clients more. This is a major goal for the year – and I can’t wait until I get there. But first, I need to develop systems so I can make sure my hire is ready to take on the job and learn it the right way from the start. Always develop systems! Your Turn – Download the Goals and Reflections Document! Like I said, I want to share the document I used with you. Credit for the first set of question goes to Into Mind. The rest comes from a variety of resources and things I’ve learned over the years. I recommend printing it out and doing it by hand, so the PDF might be fine (adjust the mind map first if you’d like, as well as spacing to add pictures under your Dream House, Car, etc..). Doing it by hand is more meaningful. I did this first, THEN transitioned it into a document so I could review my answers a second time AND keep a digital copy – just in case. Now next year, you can review this document and see what worked out and what changed. Let me know if you found this helpful to you! Feedback is appreciated!